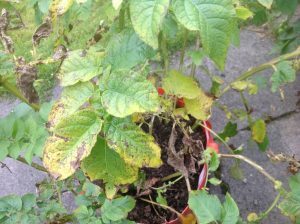 There are two main things that will impact on the growth of your potatoes – blight and blackleg. Blackleg will make the base of the stems look quite black and slimy. Blight starts with brown spots on the leaves which then turns the leaves brown and will work its way down the stem. It is particularly prevelant in years where there has been a lot of rain and remained humid, so an ideal year unfortunately! The key to both of these is to cut the stems down before the disease can get into your tubers. I have had a problem with it in my allotment and also on the Maris Pipers that I am growing at home, here is a photo of them before I cut the stems down. It will of course impact on the size of the potatoes but better to get some clean small ones for eating than ending up with rotten inedible tubers.